You are a duck! What do you want? Maybe you want to embark on high adventure on the open seas, woo beautiful pirate queens and seek buried treasure? Maybe you want to get yourself an education, push back the boundaries of science and explore the worlds of art and literature? Or maybe you just want a quite life by the pond, begging for scraps of bread, chasing lady ducks and catching the odd fish? You are a duck! This is Your Adventure! You decide! 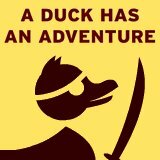 'A Duck Has an Adventure' is unique hypercomic adventure game that challenges you to discover all the different possible lives one duck could live. From adventures on the high seas to the halls of academia and beyond, every choice you make builds a new pathway along which to explore. 16 unique endings to discover! 12 achievements to unlock! And 7 hats to collect! Yes! Hats! Wooo! You are a duck! Your adventure begins here! QUACK!